For innovation, you need imagination, drive, and passion. 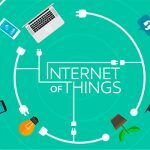 IoT is often described as a technology of sensors on otherwise ordinary objects and the aggregation of the data from those sensors. It is imagination that allows a developer to see the potential behind those sensors to change commerce and our everyday lives. Sudha Jamthe is not just imagining the future, she is ready to help develop it. 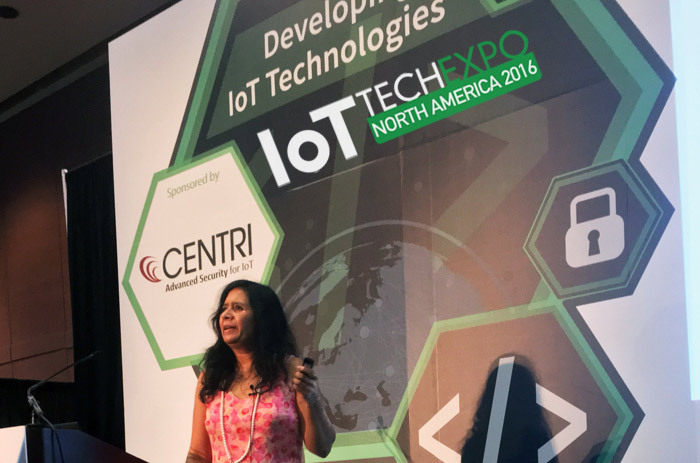 Sudha Jamthe, Mobile Business Leader, Stanford Instructor and IoT Author, has been active in IoT and machine learning for more than 20 years and has written three books on the subject. She also has built products and new business growth at multinational corporations such as eBay, AOL, PayPal, GTE, and BMC Software. Her most recent book titled “IoT Disruptions 2020: Getting to the Connected World of 2020 with Deep Learning IoT” clearly highlights that her attention is focused on the future of IoT and innovation. 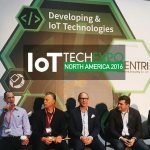 Jamthe presented a keynote speech at the 2016 North American IoT Tech Expo on business disruption in IoT and the human being’s changing relationships with IoT. 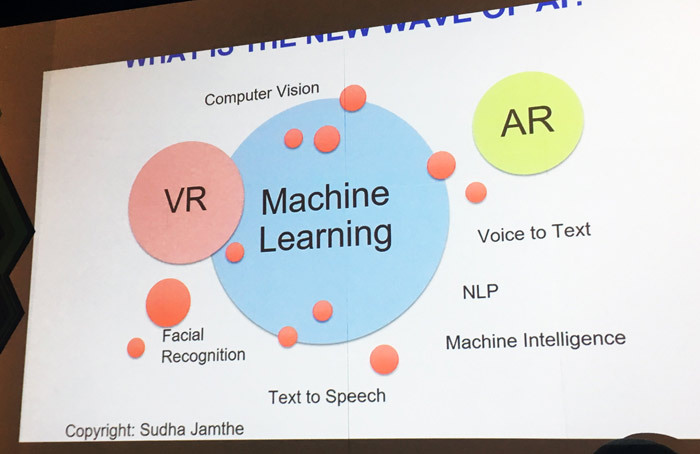 In her speech, Jamthe spoke extensively about the interconnection between AI, machine learning and IoT. According to Jamthe’s view of IoT and business development, machine learning and AI are core aspects of IoT. 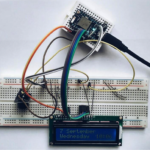 The sensors of IoT and data gathered from IoT is often simplified to quantified information about the physical world, such as how tall, short, heavy or dense an object is. The real information gained from IoT will be and should be what IoT learned from interacting with human beings. The information gained from IoT capable of machine learning is more than, for instance, the physical data of an object’s place in space. According to Jamthe, the data gained from machine learning is the information robots and IoT devices need to better navigate human world. As those devices become better at navigating our world, and as developers and innovators learn how to break tasks down into steps so machines can perform more efficiently and effectively, more and more tech industries will be disrupted. Jamthe spoke about the work IoT, drones, and robots will be able to do in the future. According to her vision, any job that can be “broken down into finite steps” will be subject to machine learning. In business disruption and IoT changing the nature of jobs for human beings, Jamthe sees unlimited possibility. After her keynote speech Jamthe sat down with DevicePlus to speak further about her thoughts on innovation, business disruption, IoT and the future of work. 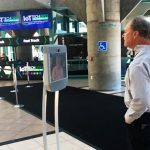 Device Plus (DP): You’ve been quoted to say that “real innovation creates jobs” but a lot of people assume innovation has the opposite effect. What do you mean by that? Is the different understanding due to a different concept of what innovation is? People talk about robots taking away our jobs. Let me give you some examples. Self-driving cars, for instance, can replace about 3.5 million US truck drivers. The same thing could be said for all kinds of automation. I was giving a presentation today about this primary care doctor who is doing a diagnosis. One day in the very near future, it’s predicted that their job will be replaced. People in the past had to do a lot manual labor, some required extensive physical activities such as washing clothes on stones. Now there are machines for pretty much everything. Indeed, development of such technology did take away the job of the people who were doing manual labor, but it also created convenience for the people who didn’t wish to do those physical activities. This whole AI revolution is really about “intelligence”. We’re able to do things with our brain, but we’re not doing the best and all we could. In some way, I believe, we are wasting our brain power doing mundane things. So, we developed AI which can do mundane labor for us. If something can be taught in finite steps, and if it can be done successfully, then we should allow this “something” to serve the purpose to the best of its ability. Holding onto traditional ways without considering further innovations and improvements, in my opinion, is not the best way of using our brain power as a human being. At a philosophical level all those mundane jobs, which are not putting a human brain power at best use, will disappear. It will take some time to be machine learned, get the right data to do the right stuff, but soon growing AI trends will change the very definition of workforce. So when I say innovation creates jobs, what I mean is innovation is about creating a new way of life. DP: You’ve said that in the future the jobs a human will do will be a job of the mind. What do you mean by that? Just look at the recent developments made in the field of robotics or drones. More and more we have machines and devices replacing our everyday mundane labors. You will realize that the number of hours humans have to spend on those jobs are pretty much gone. This allows us, humans, to pursue our creative endeavors. Really, a job of the mind equals pursuit of “creative endeavors,” and the later equals “productive utilization of the brain”. When we are free from mundane labors we can pursue creative endeavors, and the definition of creative endeavors will depend on each individual. I think human beings, from the beginning, are striving hard at doing things. We are always looking for new creation and innovation. It’s in our DNA to make our life or our world around us better. DP: What is your definition of IoT? The traditional definition of IoT is to make things smarter by taking advantage of the available sensors and the interconnectivity. My personal definition of IoT is making “ordinary things” around us smarter. I don’t think it’s just about “things”. By turning ordinary things into smart gadgets we change our way of life fundamentally, in a good way of course. It sounds simple, but it’s a complicated process. DP: What do you think is the challenge to having IoT that will control one’s life = personal data? The challenge is: who do we trust when it comes to IoT managing and controlling our personal data? Any commercial entity will have a vested interest to collect our data and there is always risk of personal data manipulation. They will promise you that your data is safe and they will never invade your privacy. There is this inherent doubt: how far can we trust? It’s a very sensitive topic, and I think consumers must educate themselves on privacy issues, and the companies need to do a better job at disclosing how consumer information is being collected and used. DP: What has been your experience as woman in IoT and in this industry in general? In IoT, many of the devices, believe it or not, are being built by guys. One example is Fitbit, was a company founded by James Park and Eric Friedman. I have a quote by Melinda Gates. She said Fitbit was done by men and so they did not take women’s period into consideration while designing the activity trackers. I mean, naturally, guys won’t take those factors into consideration. There are so many IoT products out in the market. I don’t know how many women are in the development teams, but if I were to have my own company, I’d want women to equally represent my team. DP: Do you think IoT design would benefit from more diversity in general? I think it’s an interesting question. I think so. For example, Amazon Alexa, requires users to interact with the device using words such as “Eco”. Say my husband, who is very quiet, were to use this device. As a quiet person, he would very much appreciate his quiet time. To fully take advantage of this intelligent personal assistive system, you need to “talk”. I don’t think it’s natural for him to talk so much. If we can take different accounts into consideration when designing and developing devices, we can create a truly “intelligent” system that can benefit many. So in Alexa’s case, it would be very interesting if the team can also incorporate a new way to communicate with Alexa for those with a quiet personality or inability to speak, such as communicating by facial or physical expressions. 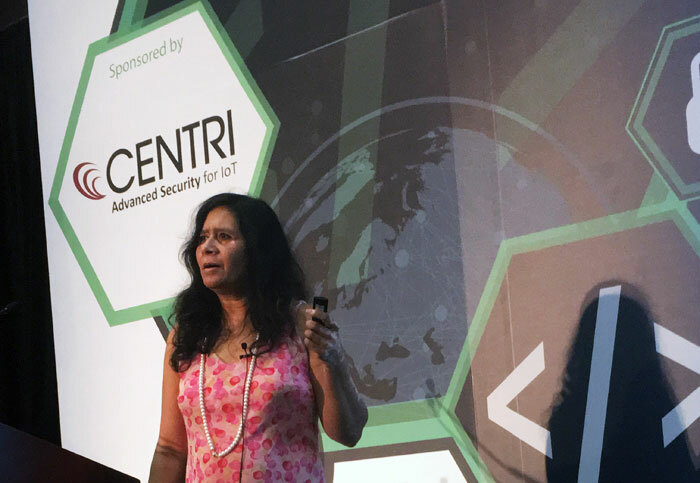 During her keynote speech and the later interview with DevicePlus, the author and IoT developer, Sudha Jamthe discussed the unlimited potential of IoT to affect our everyday lives. 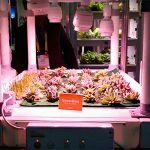 It is difficult to deny that IoT is and will be further disrupting or changing the way we live. In the future with IoT and AI, the very nature of the work most human do will change. Yet, as IoT takes over many jobs the extra human brain power will feed more innovation. Jamthe discussed her students and co-workers who find new ways to use IoT and business to work. When innovation and IoT disrupts one business, Jamthe suggested, human beings will seek for a new problem to solve. As Jamthe put it in her closing remarks at the Tech Expo,“You either disrupt, or you are going to be disrupted”. 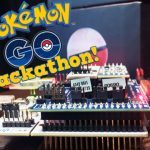 Want to Make DIY Internet of Things Projects?